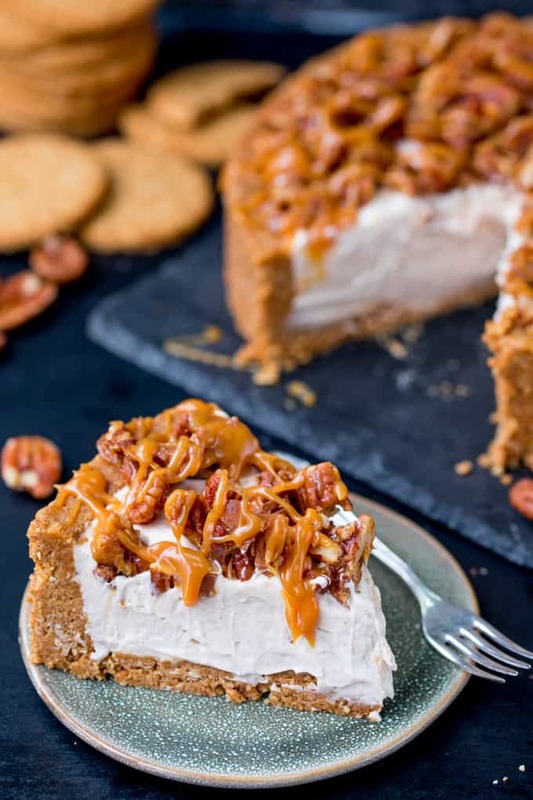 Home > Cakes, Desserts & Treats > Winter Spiced Pecan Caramel Cheesecake – no bake and gluten free! 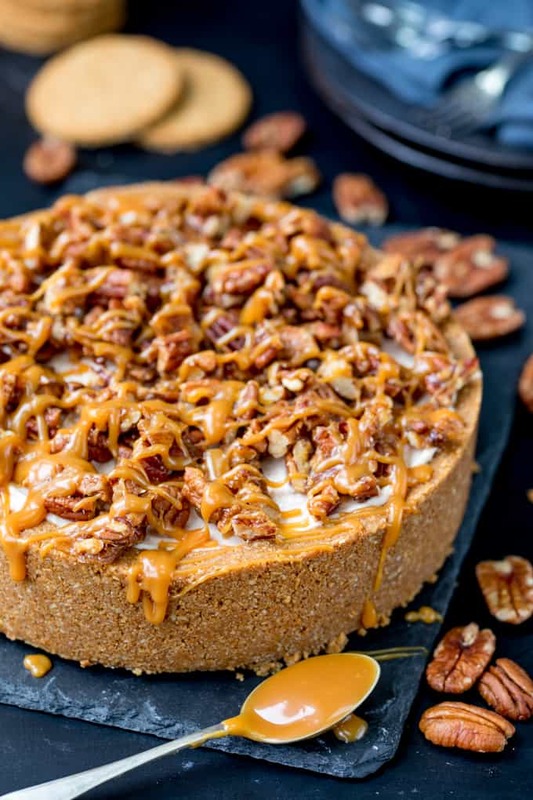 This Winter Spiced Pecan Caramel Cheesecake is an ideal dish for a celebration party table! 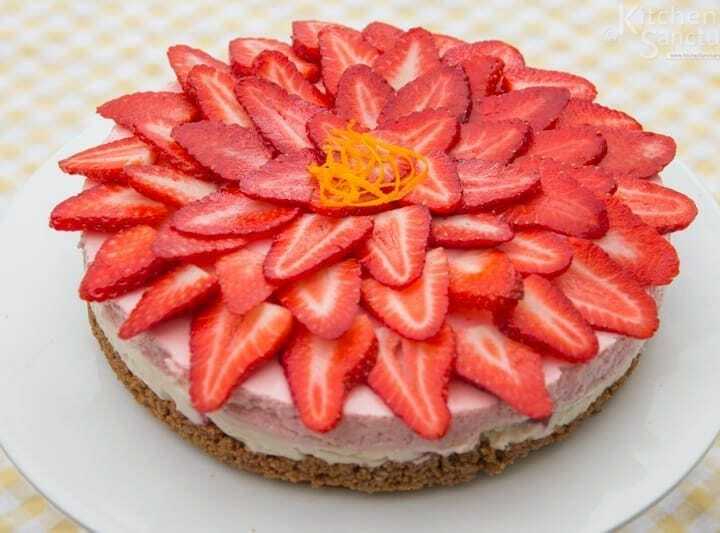 I made this cheesecake a couple of weeks ago based on a freelance recipe I did last year. I was craving crispy candied pecans (it’s a good idea to make double the amount needed for this cheesecake, just for snacking purposes!) and this recipe jumped into my head. A few adjustments later – to give it more of a winter feel with some warming spices, and also to convert to gluten free for my mum-in-law, and yessss! This sweet, crunchy, creamy dessert was done. Made ahead of time and ready to serve (minus the tiny test slice for photography purposes….. ????????). We were having family round to dinner, so I thought I’d use them as guinea pigs to trial my leftover Turkey Tikka Masala (look out for that recipe this weekend). I also made my beef rendang and a huge salad with creamy curry-spiced dressing (the same dressing I used in this fennel and apple salad). Served an assortment of food that doesn’t necessarily match (especially if we’re photographing multiple recipes) – after all, I served an Indian style buffet with pecan caramel cheesecake!! Occasionally having to take part in a photoshoot (such as hands picking up a piece of food) before you’re allowed to eat. I managed to hit 4 out of 5 of those points for this last get together. My poor family!! Nevertheless, it all got eaten, and everyone left with full bellies. The cheesecake was that perfect ‘I’m too full to eat, but I’ll just have a small slice. No, a bit more…..’ dessert (that everyone somehow managed to squeeze in). A classic no-bake filling, spiked with winter spices such as cinnamon, nutmeg and ginger, all piled into a gluten-free oat-biscuit base. It was actually more of a case than a base. Can’t get enough of that buttery biscuit-ness! The pecans are simply cooked with sugar and a little butter until the sugar melts and lightly coats the nuts. Once cooled, they’re perfectly sweet and crunchy! 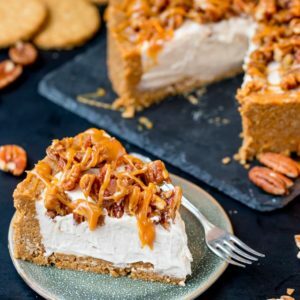 Winter Spiced Pecan Caramel Cheesecake - no bake and gluten free! 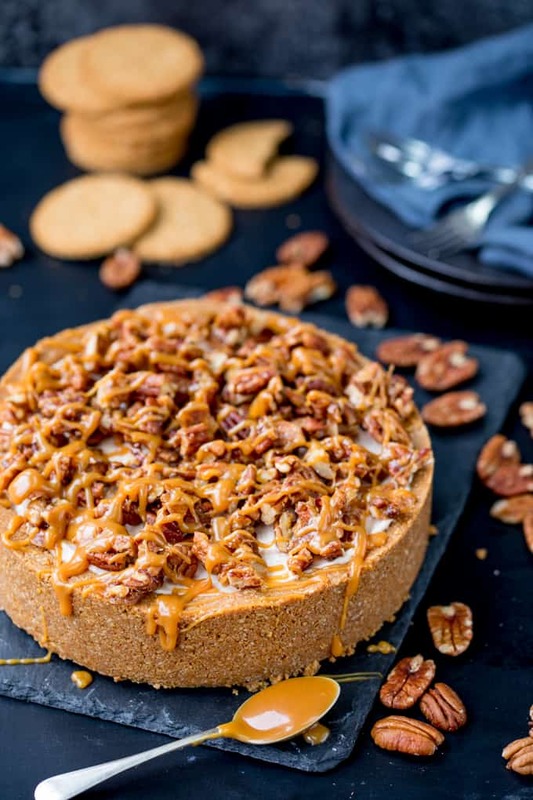 This Winter Spiced Pecan Caramel Cheesecake is an ideal dish for a celebration party table! It's also make ahead, no bake and gluten free! Place the oat biscuits into a food processor and pulse until they turn to crumbs (alternatively you can place in a large sandwich bag and crush using a rolling pin). Transfer to a bowl and mix in the melted butter until evenly combined. Take a 23cm (9-inch) diameter baking tin with a removable base and line the base with a circle of baking parchment. Spoon the biscuit mixture into the tin and press the mixture into the base and up the sides of the tin. 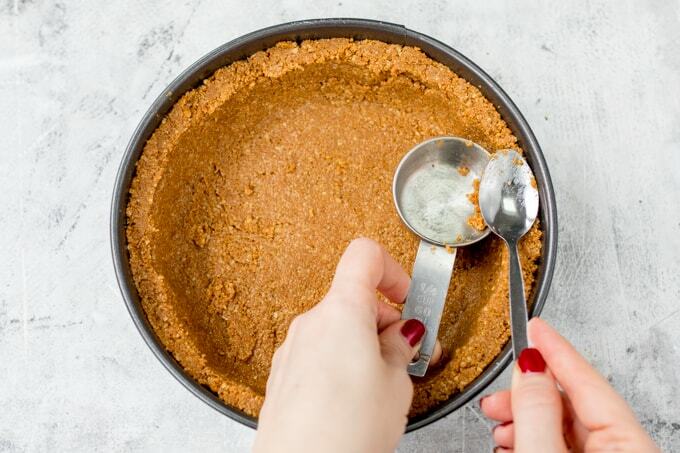 **Tip** Use a small measuring cup (1/2 cup or 1/4 cup size) to press the mixture into the side and edges of the tin and a teaspoon to flatten the rim of the cheesecake crust. 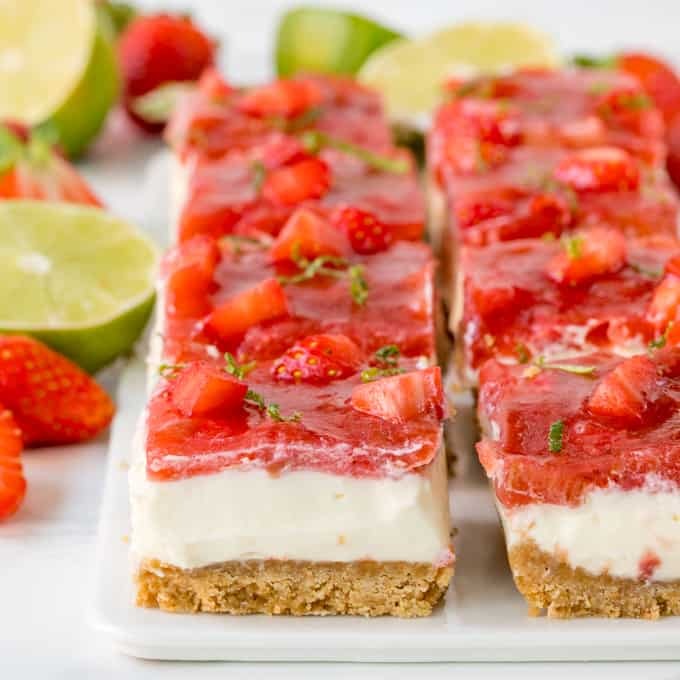 Place in the fridge to firm up while you prepare the rest of the cheesecake. Next make the caramelized pecans. Place a piece of non-stick baking parchment on a baking tray or large plate, ready for cooling the nuts. Add the butter and sugar to a frying pan (skillet) and heat over a medium-to-high heat until the butter has almost melted. Add the pecans and stir together. Continue to heat for 3-4 minutes, stirring often, until the sugar has melted and is coating the pecans. Turn off the heat and carefully transfer the pecans to the prepared baking parchment. Quickly and carefully spread out using a spatula, so the pecans can cool in an even layer. Once cooled (takes about 10 minutes), roughly break apart. Next, make the cheesecake filling. Whisk the cream in a large bowl until soft peaks form. Add the cream cheese and whisk again to combine. Add the confectioners’ sugar, vanilla extract, nutmeg, ginger and cinnamon. Whisk again to combine. 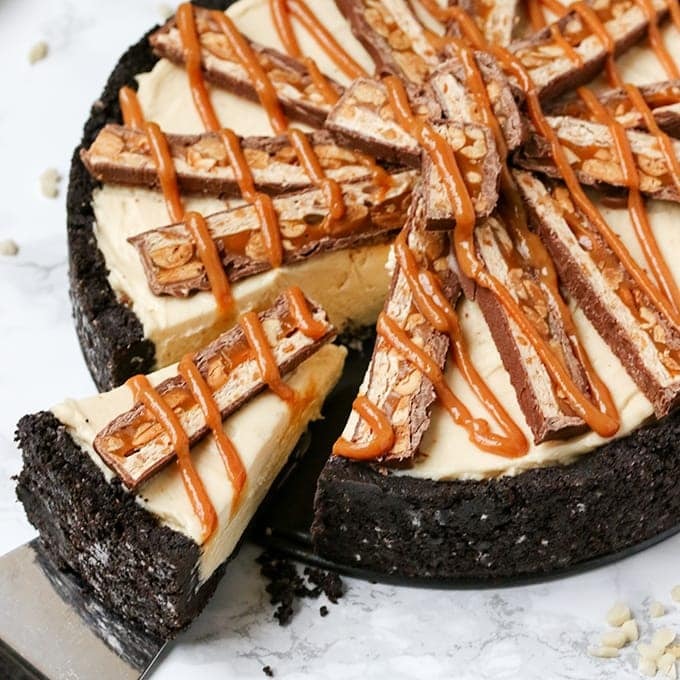 Take the cheesecake crust out of the fridge. Spoon in the cheesecake mixture and flatten with a spatula. Sprinkle on the caramelized pecans. Refrigerate for at least 30 minutes (up to a day*) to firm up the filling. When ready to serve, remove the cheesecake from the tin and carefully remove the parchment from the base. 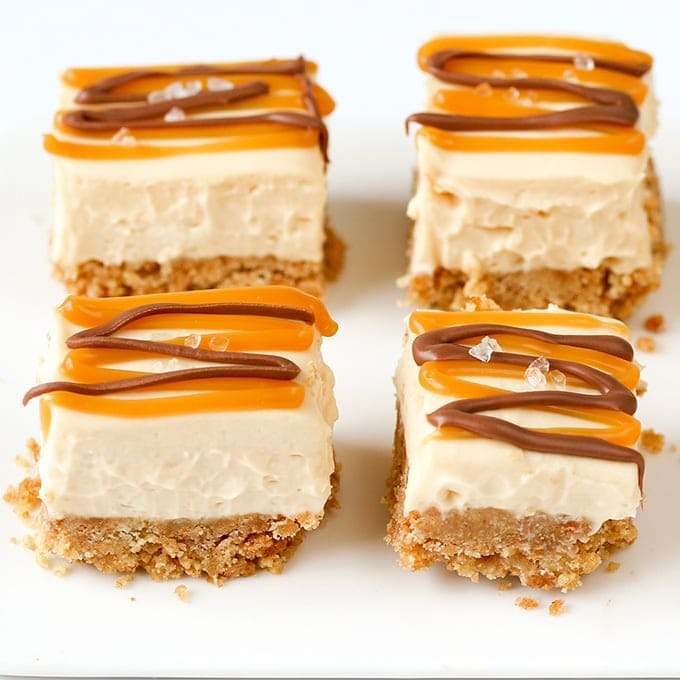 Place the cheesecake on a plate and drizzle over the salted caramel sauce before serving. * If refrigerating for more than a couple of hours, keep the cheesecake covered with clingfilm. Remove from the fridge 30-60 minutes before serving to soften the biscuit base slightly. Sorry but I made this in summer! I love the fact the crust goes up the sides of this gluten free cheesecake. I love pecans too, so I just had to make it.